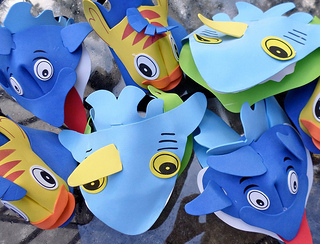 Get your shark party ideas for games, decorations and invites for the coolest themed pool party. 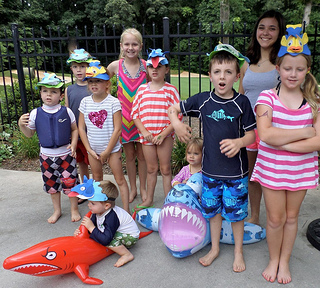 There are lots of shark sightings at this kids pool party theme that works for all ages and for girls and boys. 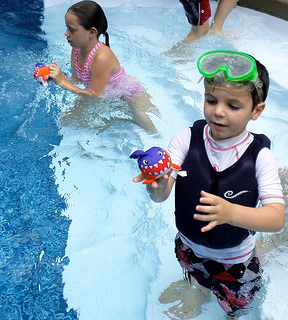 Spend your money on fun shark floats, pool toys and games rather than fancy paper goods. 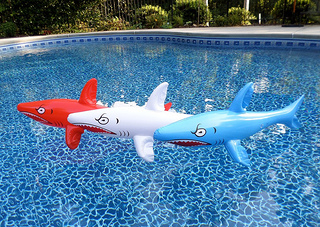 Inflatable sharks are watching and waiting to make their first "attack" when the kids arrive. The first place kids look at when coming into our backyard is the swimming pool - because of course they can't wait to jump in it. 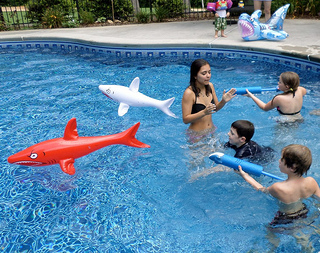 The inflatable sharks are used for decorations and shark party games. 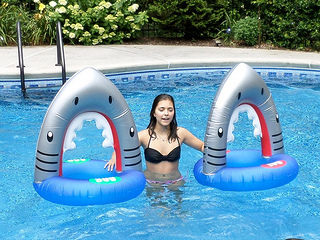 Use your inflatable sharks for decorations as well. 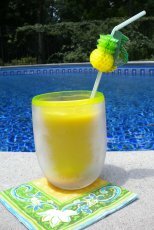 Hang one on the pool gate or hang several from the ribs on the patio umbrella. 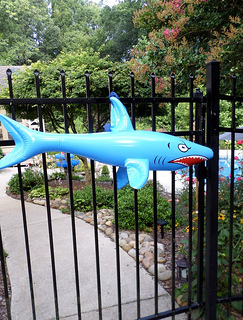 Hang an inflatable shark on the pool gate. Use them as pool decorations too. Don't you love these guys? I got 3 of them for under $9 at Amazon. 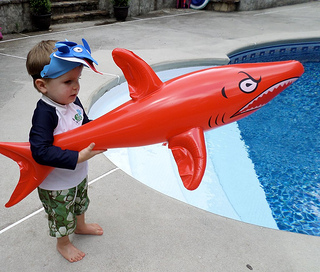 They are nice and big, 24" long and provided lots of fun for pool party games. This little guy isn't afraid of any hungry sharks. They became best pals. I wished that I had bought 6 of them, instead of just the 3. 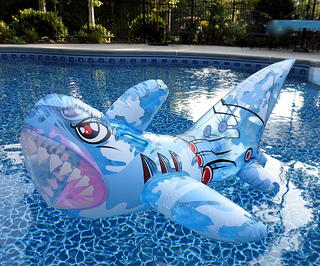 This large - 2 feet - inflatable shark would love to join you in your pool. 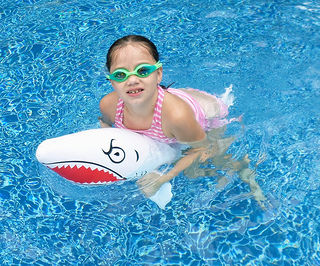 His real looking mouth and fins is sure to bring a realistic element to your pool. 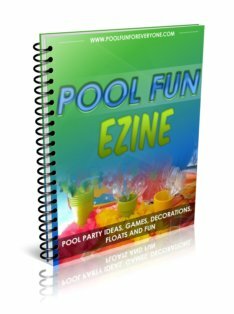 Put him in the pool for pool decorations and your swimming pool games. 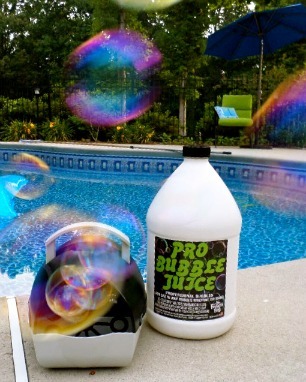 Creative Motion Bubble Machine and PRO Bubble Juice. 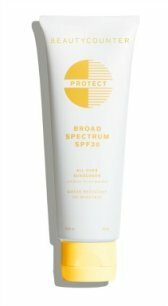 I read lots of reviews on Amazon and decided to try this combination - and the result has been tons of bubbles and tons of fun. When the kids first arrive hand out shark or fish visors. I got an assorted group of 12 Sea Life Animal Visors from Amazon for just under $20. Be sure to take a group picture before everyone get's into the pool. The visors are made of foam so they can be worn in the pool and can get wet. The colors are bold and bright and the sheet is large measuring 40" by 50". It's always fun to give your teams a themed name. Our two teams were named after shark species, the Tiger Heads and the Hammer Heads. Other shark names are Blue Sharks and Great White Sharks. 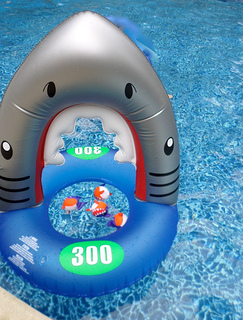 Get two Shark Max Liquidators and use them for your pool party games. 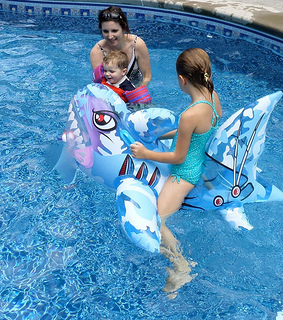 The goal is to move the shark to the other side of the pool by squirting it with water. 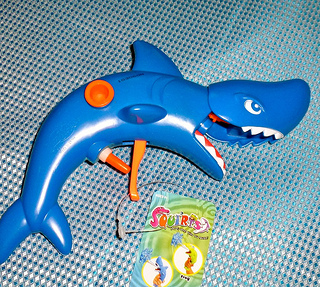 Shark Dive Use fish themed dive toys for your dive games. Toss in two dive toys - one player from each team swims to get one of the fish and brings it back to the adult. The adult tosses the fish in again for the next team players. 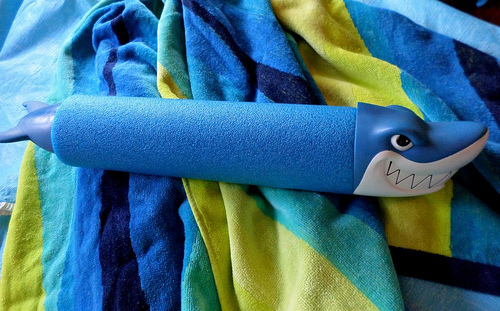 Don't you just love these shark mouth inflatables? We used them for races. Have a person hold them in place so they don't float away. One player from each team races to the shark mouth , touches it, swims back and tags the next team member. 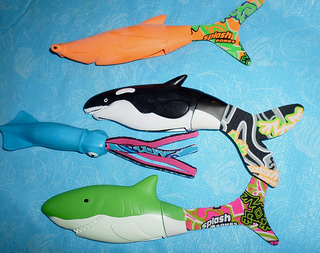 Each team is given an inflatable fish. The goal is to stay on it and swim to the other side and back. The next player takes his turn as well until the first team that finishes wins. 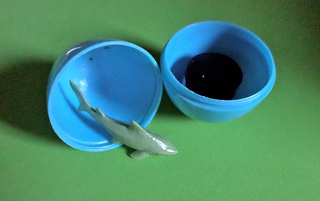 Shark splash bombs were a lucky find at our local Kroger grocery store. I bought them all since they were a dollar a piece :). Kids lined up and took turns throwing the splash bombs through the shark mouth. One point for each splash bomb that makes it through. The team with the most points wins. 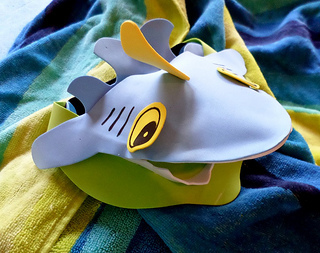 Played just like Marco Polo, one player, the Shark yells Marco (with his eyes closed or or covered) while the rest of the players, the Guppies, yell Sharko. The Shark tries to tag one of the Guppies and when he does that Guppie becomes The Shark. A fun version of freeze tag in the swimming pool using a shark fin. It can be one of the guests or one of the adults. When the Shark tags one of the players he is frozen and can't move. The Shark keeps playing until he is able to freeze all of the players. Get two swimboards - one for each team. Simply have each team member swim to one end of the pool and back. Hand the swim board to the next player. Continue until every one has taken a turn. Who wouldn't love these fun cupcakes? So easy. 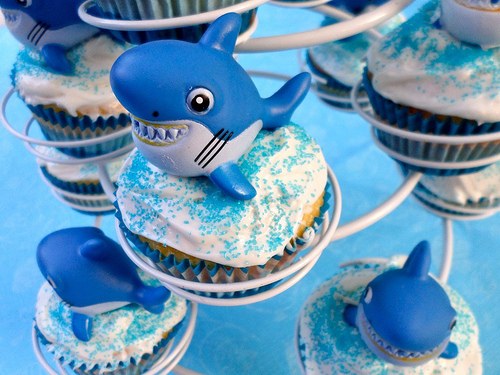 I bought one dozen shark squirt toys from Amazon and used them as cupcake toppers and take home favors. White frosting sprinkled with blue sugar and heavy duty blue cupcake liners that don't fade made these treats a big hit. I used white cake mix so that the liner colors stayed vivid. If you use chocolate the colors really dull. 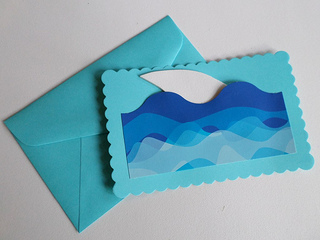 I made the pool party invites using this Waves of Blue Border. The card stock paper and matching envelopes came from a large box of assorted card stock from Target. If you need to buy them on line, Amazon sells an assorted box of colored cards and envelopes. I use them all the time to make my invites. I love how this one has a trimmed border. The white shark tail is made from foam paper. The two pieces are simply glued onto the party bags. Embellish with some white ribbon and white tissue paper. 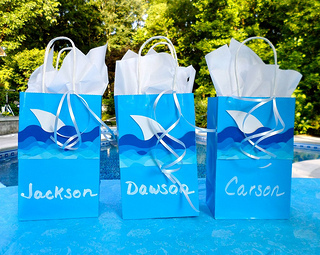 Write the names of the guests at the bottom of the bag using a white chalk pen. These pens are sooo cool because if you goof up, you can just wipe it off and do it over. 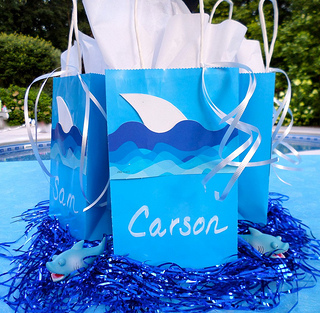 The turquoise blue paper bags can also be used as your centerpiece. Use the party bags as your centerpieces on the party tables. Add a couple of more mini shark squirters tucked in around the bags. Not lots of money was spent on paper goods - we used blue paper plates and cups and spent our party money on fun floats and games.